Looking for more height temporarily? Get your laptop on top of those unused boxes and give your back a break! Image by Kristin Mueller. Have a few extra desks? Need more storage space? Stack them! Image by Kristin Mueller. What’s under a desk is just as important as what’s on top. With a height adjustable desk this space comes to life! Image by Kristin Mueller. 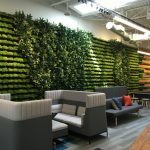 Plants and greenery not only improve mental and physical health but they are a cheap and easy way to literally bring life to the workplace. Photo by Sasha Ragland, edited by Kristin Mueller. I really loved some of the ideas. The height adjustable desk is a great option, and should offer additional storage space. It’s left to be seen, though, whether it’ll be as comfortable as a regular desk. Partitions are always a good way to have privacy in the workplace, while retaining the spacious feel.